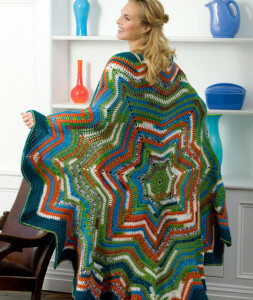 This star throw is sure to impress and please your family and your circle of friends. Crochet it in the variegated colors as shown, in seasonal colors, or in any colors to match your home. You will need a worsted weight yarn and a K and J crochet hooks. If you enjoyed this free crochet pattern you might also enjoy more designs by Ann Regis or Red Heart.